The motive has been created and lengthened into a phrase. The phrase has been developed. Now the task is how to put phrases together to make a complete song or tune. This is the final step in creating melody; setting the structure. The topic of melodic structure is vast. But, this presentation will focus on what is useful to a singer-songwriters and composers of traditional style music. Melodic structure can be divided into two topics. One is how to define the overall structure of a melody. The other is how to define the structure of melody within a part. Two structural forms are most useful for singer-songwriters and composers of tradition music. This is probably the original form of song. In strophic form the same music supports every stanza. Many folk song are strophic: Michael Row the Boat Ashore, Erie Canal, Farewell to Tarwatie, the 12-bar blues form, and so on. 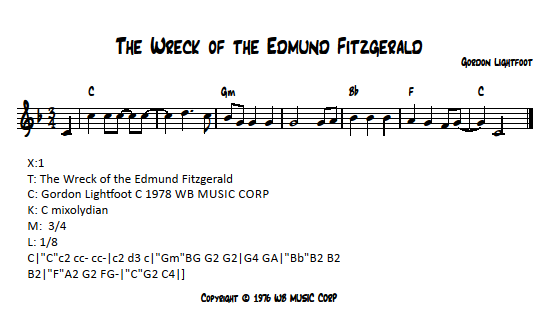 ​A more contemporary song in stropic form is Gordon Lightfoot’s Wreck of the Edmund Fitzgerald. Look at the music and listen to the song. One, only one, eight-bar phrase is the sole melody of this song. This is strophic form. This highly successful song runs about 6minutes and 30 seconds long. It’s just one eight-bar phrase repeated over and over and over.